Absolutely fantastic! Beautiful home, wonderful spacious rooms and outstanding breakfast. Made very welcome with tea and cakes when we arrived, They booked us a restaurant for the evening and even took us there. Great breakfast in the morning in light airy conservatory. Excellent accommodation. Best breakfast we have ever had. Friendly well informed propriorters. A beautiful house. It was a pleasure to stay at Ashcille house. 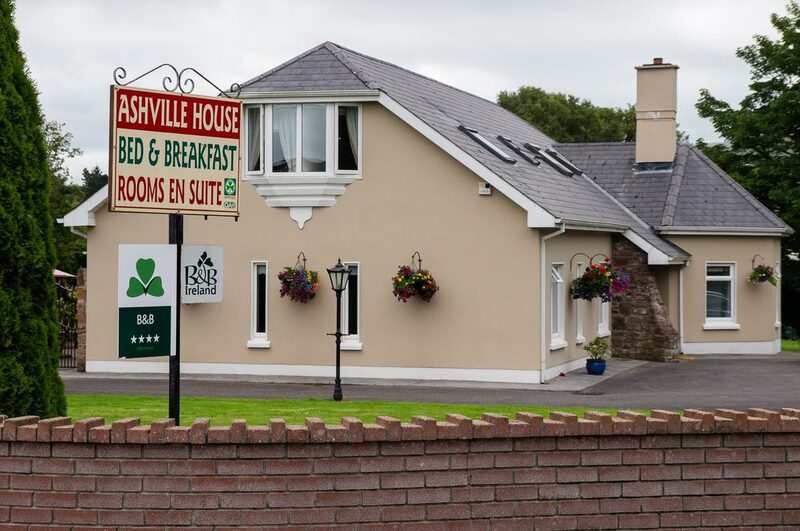 This B&B was our best accommodation while on a ten day touring holiday of Kerry and Cork. The welcome from Rose and Tim was genuine and consistent during our stay. They appeared to receive their guests as a personal pleasure more than a purely business interest. All accommodation in this purpose built guest house is spacious, spotless and extremely comfortable. The breakfast options are extensive and delicious. Nothing was too much trouble for our hosts. All in all a thoroughly pleasurable experience. Lovely home, warm welcome, perfectly cooked eggs! Very pleased with the structure which was clean and tidy. Hosts very kind and helpful with information on local places to eat and willing to satisfy our requests. Good, wholesome breakfast and pretty, well-kept garden. Ample parking space. We only stayed a couple of nights, but will probably book with them again next year when I am organizing a trip with a group of friends. My only advice: provide kettle, coffee and tea in all rooms as standard. Otherwise, absolutely no complaints. My sincere thanks to very obliging hosts. Everything is perfect! Don't miss staying here. The hospitality, the breakfast, the clean and cheery rooms, the living area, the yard. Tim and Rose are especially nice and accommodating and there to guarantee you are comfortable and happy. We loved staying with them and will do it again, and surely tell our friends about this wonderful place in Tralee. We were amazed with everything about our stay at the Ashville House. The B&B is decorated beautifully. The hosts went out of their way to be accommodating and served drinks to the guests after dinner. The breakfast buffet was gorgeous with orchids in vases on the table and bowls of fruit and other items. We ate in a beautiful sun room and the hot breakfast was wonderful. We would certainly stay here again and recommend this to other travelers. This was by far the best B&B we have stayed in. Extremely comfortable three-night stay during our first Ireland trip by motorcycle. Very friendly hosts who made our stay perfect. Highly Recommended. We stayed at the Ashville only 1 night, but it was simply perfect. Very very beautiful! The breakfast rich and various in their nice garden. The house was beautifully refurbished, and our host/hostess were gracious. The glassed-in breakfast room absolutely fabulous! And the best selection of fruit we'd seen on our trip. My only complaint/suggestion is to be sure you get an upstairs room. We were on the ground floor and the guests upstairs were trompling over our heads until well after midnight! We stayed in several B&B in ireland and I was blown away by this house. ROSE was absolutely welcoming- the house is brand spanking new, it seems like anyway. Everything is above 5 - rooms are spacious, own bathroom in each room, which they warm the towels for you!! Let me say again- They Warm the TOWELS FOR YOU! Amazing! Breakfast was so beautiful in their foyer, and the house was very quiet. We appreciated the small snifter of whiskey on our entrance, really took the edge off and really made us settle in. I would go back here in a heart beat and tell everyone this was by far the best we'd been to. Thanks ROSE! My stay was perfect , Rose was a wonderful host and very obliging she cooked up delicious Irish breakfast and we had many other choices always fresh fruit was served. She helped us with directions and was not afraid to advise us on the perfect day to see Dingle Bay and Conor's Pass. She advised us to eat in some nice eateries in Tralee. Rose made us feel very welcome and it's the perfect location if you want to spend a few days in Tralee . A wonderful b&b. Tim and Rose are very welcoming and helpful. Wonderful rooms and great breakfast. First class all the way. Would recommend it highly. Our only regret is that we had to leave to move on with our vacation. We stayed unfortunately only two nights at this B&B and can only recommend this house to other guests. Very professional and well organized hosts, comfortable rooms and a broad offer of breakfast choices. We would come again. Our stay with Tim and Rose was exceptional. We toured Ireland for 2 weeks, and the Ashville House was the best B&B we stayed at the entire trip. We were there nearer to the end of our journey, and when we arrived we were worn and weary. Tim greeted us at the door, got us settled in our room, and then served us a fine Irish tea, in front of the fire, in the very comfy sitting room. It was a chilly summer evening, and the fire, tea and books all around were a welcome tonic for us that evening. Tim even booked ticket for us at the National Folk Theatre show for our second evening, which was terrific, so don't miss that if you are in the area. The location was ideal, just slightly outside of town, but easy to find and easy to get back into town, or anywhere on the Dingle Penninsula within an hour or so. We would highly recommend Tim and Rose's exceptional home to anyone! Our second visit to one of the best b and bs we have ever visited. Beautiful accommodation, superb guest-rooms, excellent breakfast and lovely, welcoming hosts. Rates are very modest for the quality offered. We would thoroughly recommend. During our three weeks of holiday, this was the best beds and the best breakfasts ! Beautiful house, a garden with nice flowers and sweet music for a peaceful atmosphere. Thanks again to Rose for her warmly welcome with tea and cookies, her help when needed and all the useful informations. If we have one B&B to recommend it will be this one ! 3 nights stay in a marvelous house with a beautiful garden. The breakfast was extra-ordinary. We can fully recommend this fine place and will definitely come back when next time in Ireland. Our stay at Ashville House was lovely. Rose and Tim were most gracious. One of the best B&B experiences we have had in our 3 visits to Ireland. Accueil froid ... Presque aucune communication mise Ã part "70â‚¬ please" Chambre magnifique, maison trÃ¨s bien entretenue, trÃ¨s bon petit dÃ©jeuner. From our first welcome cup of tea in the sitting room everything was perfect. The house is in excellent order, very tastefully furnished and decorated, very clean and warm. Our room was delightful, attractively furnished with a very comfortable bed, clean shower room with beautiful soft towels. Breakfast in the sun room overlooking the garden was good, with a delicious fruit salad each morning. Rose and Tim an excellent hosts, and we had helpful advice about routes and places to visit. We stayed an extra day because we found Ashville House so delightful.